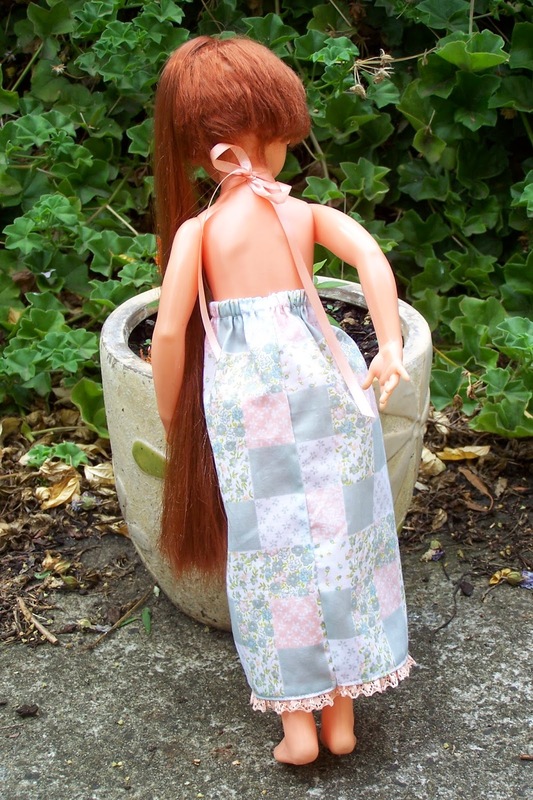 Lizzie's Arty Crafty 'n Dolls: Dolls! Ideal Crissy Gets a Maxi Dress Too! Dolls! Ideal Crissy Gets a Maxi Dress Too! 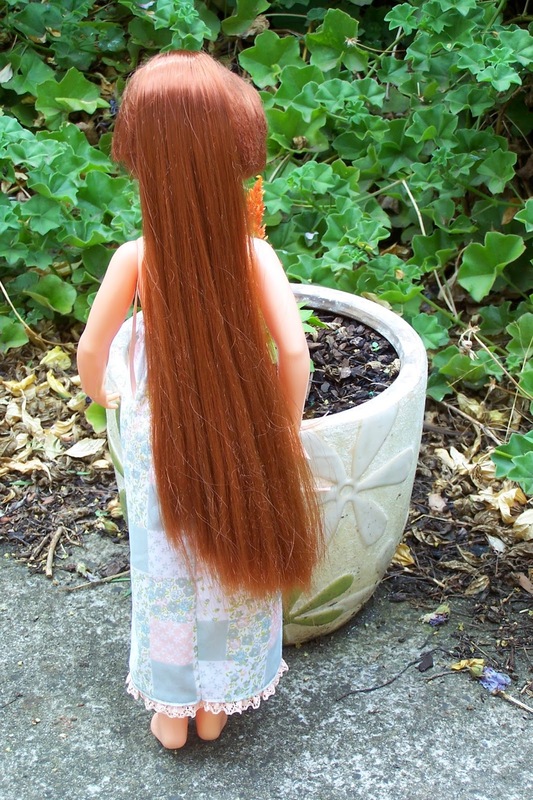 This is my poor little Ideal Crissy doll, who has had her base hair trimmed at some stage by a previous owner. I still think she is great. The 70's were a back to nature movement for some people, so I have used a folksy patchwork print fabric for her maxi dress. I think her tail has been trimmed slightly at some stage as it is not level. Happy with her new dress. 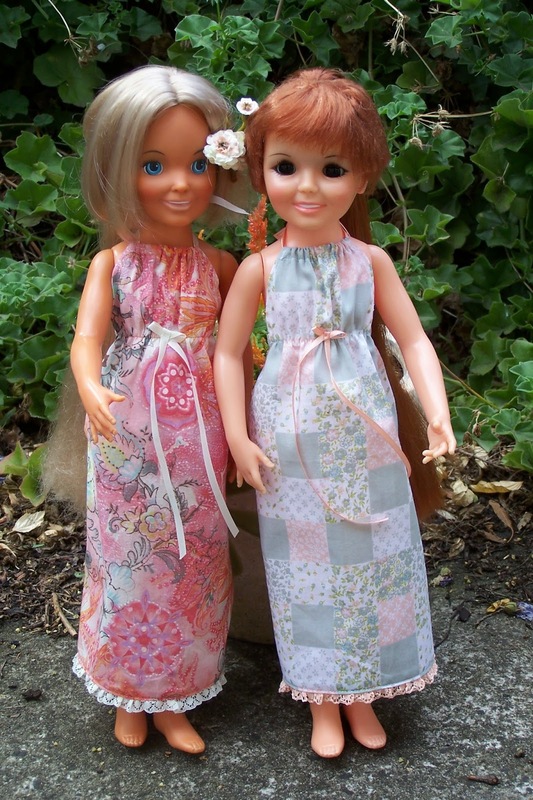 Here is Brandi and Crissy in their maxi dresses. 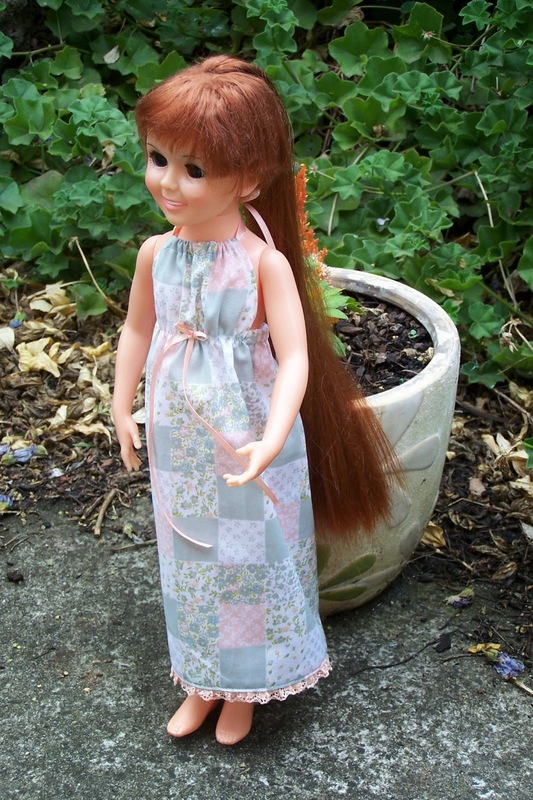 I have one more maxi dress to make for another Crissy who has the wavy base hair. Hers will be red. When that is done, I will be making another shirt for myself. The two fabrics are perfect for the retro look, they look very fashionable together! My Crissy's shortest hair part is a bit shorter on one side than the other too, I guess a lot of Crissy dolls have had hair cuts from enthusiastic little hairdressers :-). On your pictures the dollies look so pretty! Thankyou Nymphaea, I had a lot of fun picking out these fabrics from my fabric stash. I'm glad you think they look retro as that was the loik I was trying to achieve. They are very photogenic dollies don't you think? 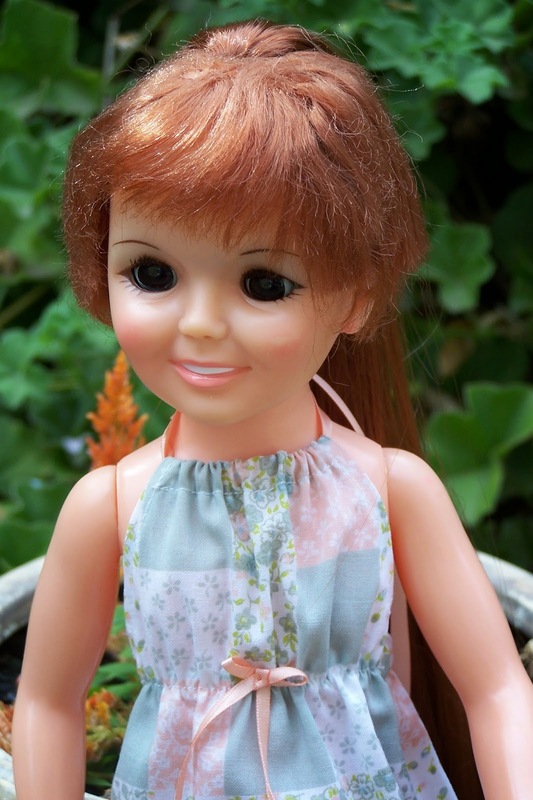 I am so glad I saw your post about Crissy on your blog and found out about these dollies. Hi Lizzie! I would like to pass the Versatile Blogger award on to you, I hope you like it! Oh, wow! Thankyou so much Nymphaea, I have never won any awards for my blog, that is such a lovely gesture! Lizzie. Your Brandi and Crissy look so pretty in their new dresses. You've really captured the flavor of the early 70's. I know because I was a child then, playing with my own Crissy and Velvet. You've done a beautiful job restoring them. Congrats on your award! Nymphaea chose well. Thankyou Raine, I really enjoyed giving them a makeover. And I can't believe I got the award! Great to hear from you again, hope you are enjoying life after studying. Her hair really doesn't look bad at all--like maybe it's a new kind of hair style! And the maxi dresses are great. They are lucky girls to have you sewing for them. Yes, it does look like a new hair style now you mention it! They are so lovely to sew for, how could I resist! Hi Billa thankyou for the compliment! I am looking forward to following yours too. Lizzie xo.